Joseph Hamill, PhD, is an avid runner who runs with a natural forefoot strike pattern. 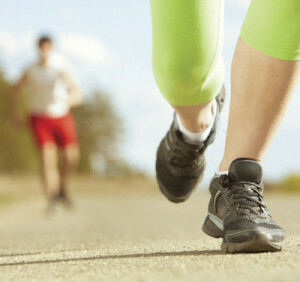 But Hamill, professor of kinesiology at the University of Massachusetts Amherst, says he wouldn’t recommend that running technique for most people, despite recent claims that the forefoot strike pattern associated with barefoot running is associated with a lower risk of injury than rearfoot-strike running. Those claims, Hamill said in the opening keynote address at the i-FAB congress, are not based on conclusive evidence and, in fact, are likely false. UMass researchers have demonstrated that, although forefoot strikers do not experience a vertical ground reaction force “impact peak,” they do experience impacts during running, albeit at lower frequencies than rearfoot strikers. This research, presented last summer at the American College of Sports Medicine meeting in Denver, suggests that because those lower frequencies are attenuated by muscle tissues, while higher frequencies are attenuated by bone, forefoot strikers may actually face a higher risk of muscle injury than rearfoot strikers. Claims that loading rate is significantly lower in forefoot strikers than rearfoot strikers also may not be entirely accurate, Hamill said. He cited research from Iowa State University, scheduled to be presented in August at the annual meeting of the American Society of Biomechanics, suggesting that when natural forefoot strikers switch to a rearfoot strike pattern, their loading rate actually decreases. Research, most notably the oft-cited Harvard study published in Nature in 2010, have found higher magnitudes of ground reaction force in rearfoot strikers than in forefoot strikers. However, Hamill noted, the heel is a much less delicate structure than the forefoot and therefore may be better suited to absorb higher forces. A study from the University of Wisconsin-Milwaukee, presented separately at the i-FAB congress, raised the question of whether changes in foot mobility associated with different running techniques also affect injury risks. In 14 runners (five women), the Wisconsin researchers found that barefoot running, which is typically characterized by a forefoot strike pattern, was associated with more range of motion in several segments of the foot than running in flat sandals. “Barefoot running may have more mobility, but does that mean more injury risk? Running in flat shoes involves less mobility; what does that mean in terms of injury risk?” said Robin L. Bauer, a graduate student in the Department of Kinesiology at UWM who presented the findings at the i-FAB congress. A UMass study e-published this month by Proceedings of the Royal Society, Biological Sciences suggests that different strike patterns may serve different biomechanical purposes: rearfoot-strike running for maximum energy efficiency and forefoot-strike running for maximum speed. To Hamill that means a forefoot strike pattern is not the one best suited to most purposes. Gruber AH, Davis IS, Hamill J. Frequency content of the vertical ground reaction force component during rearfoot and forefoot running patterns. Presented at the 58th annual meeting of the American College of Sports Medicine, Denver, June 2011. Miller RH, Umberger BR, Hamill J, Caldwell GE. Evaluation of the minimum energy hypothesis and other potential optimality criteria for human running. Proc Biol Sci 2012;219(1733):1498-1505. Bauer RL, Joshi MN, Klinkner TR, Cobb SC. The effect of footwear on multi-segment foot kinematics during running. Presented at 3rd International Foot and Ankle Biomechanics Congress, Sydney, April 2012. I think it’s clear that we don’t know what running style is optimal for injury reduction. I always caution people who want to change their form to take it extremely slowly and listen to your body. I think the best point in this article is that maybe the different running styles are best suited for different purposes. From personal experience, forefoot strike running feels more natural when you’re running at higher speeds as the UMass study suggests. Perhaps we should shift the discussion to identifying the best running style for your personal goals, not make overarching conclusions of the best running style.